Braden Askew got the win on the mound and hit a home run in an 8-6 victory at Broken Arrow. (Photo: Scott Emigh). 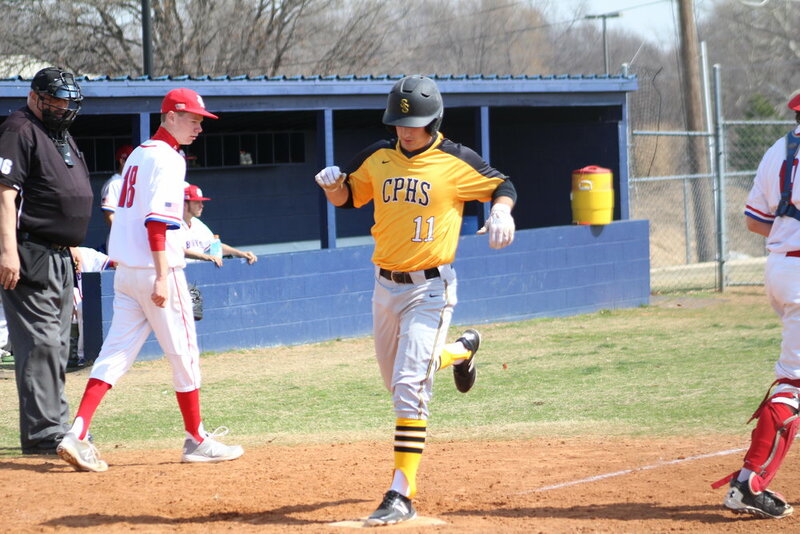 The Charles Page High School varsity baseball team (10-6, 1-2) picked up their sixth-straight win and their first district win Monday evening in Broken Arrow, dealing the Tigers (9-9, 4-3) an 8-6 loss behind a perfect batting performance by Riley Rutledge. Senior Trey Wolf pitched a pair of strikeouts in the top of the first and the home team went to work with three hits and two runs before Braden Askew (2-2, 5-4) found his groove. The Sandite struck out two and sent a ground ball to first base to bring the inning to a close. Broken Arrow scored two more in the second inning with a home run from Matt Kaiser for a 4-0 lead before Askew got the visitors on the board with a solo home run in the third. Rutledge doubled, Cale Savage was hit by pitch, and Kyler Copeland singled to load the bases. Rutledge scored on a ground ball from John Miller, then Savage scored on an error to make it a one-run game. Manny Duran scored Kaiser on a single in the fourth, but a big fifth inning gave the Sandites their first lead. Askew singled, Rutledge doubled, then both came in on a double from Savage to tie it up. Savage scored on a ground out by Copeland. In the top of the sixth Askew singled in Ty Steelman and Cal Watkins scored on a sacrifice fly by Savage. The Tigers tried to rally in the bottom of the seventh with a pair of singles and a run by Chandler Suddath, but it wasn't enough. Askew got the win on the mound with eight hits, four strikeouts, and two walks in four innings. Steelman (2-0, 2-1) picked up a save with two hits, one strikeout, and no walks in three innings. Rutledge hit three doubles on three at-bats with two runs and two RBI. The two teams will meet against Tuesday at 6:00 p.m. in Sand Springs.